Marvel's summer event that effectively combines elements of their Captain America and Thor franchises (just in time for the movies) continues, this time setting up the centerpiece of the narrative in unveiling the identities of four of the seven characters dubbed "The Worthy" while hinting at the remainder. Meanwhile, Thor finds himself in big trouble upon the Asgardians' return to the original home of Asgard, the Avengers embark across the globe, and the Red Skull's daughter Sin, now super-powered and named Skadi, begins a wave of attacks. The ambitiousness of the talents involved is clear with this second issue, and I find myself pulled in to the narrative despite my initial misgivings. Matt Fraction does a good job of introducing "The Worthy" here, giving space to each character's discovery of their particular hammer. Of special enjoyment is a certain Green Goliath's union with his hammer, and his clever new title that echoes recent developments with the character and his otherworldly associations. I counted two surprises among the four characters granted a hammer here, and I'm hoping Fraction will employ those characters' histories to full effect in later stories. (Hint: A battle with She-Hulk would come in handy.) And the others? Well, one of the Worthy is unveiled, sloppily, on both the cover and in the previews of crossovers to the story in the back of the issue, but appears nowhere in the issue itself. Another's impending contact with a hammer is hinted in this story, and on that preview page, but nobody knows if that event will actually occur. If there is a weakness to this issue, it's that all we're getting is a story's middle this month. The hammers that began their fall to Earth last month find their owners, or some of them do; the Avengers get sent out to keep the peace; and Skadi starts an invasion. It's well-textured, but still there's no clear beginning, middle or end--it's all middle! Superbly illustrated (by Immonen & Von Grawbadger), lushly colored (by Laura Martin) middle, yes, but the book only appears to be a cog in the greater event with no internal structure of its own. Even still, this second installment of Fear Itself has its share of excitement and big moments that make it worth a read. Yes, I really enjoyed this issue. 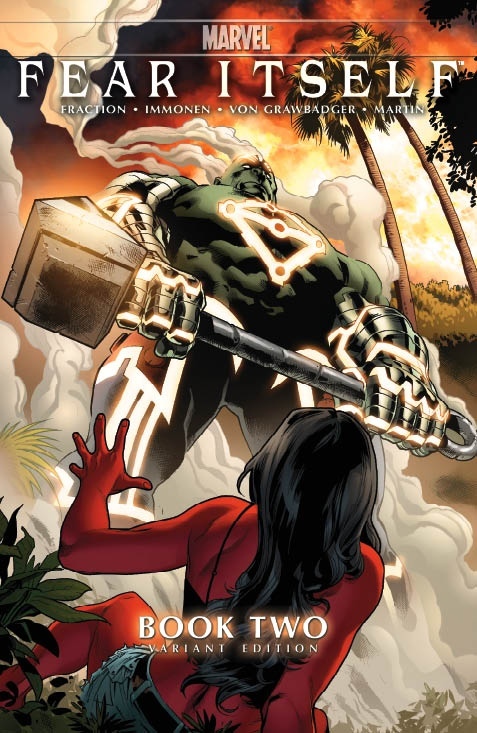 Especially the name given to the Hulk, which fit his power-level and recent storylines. Nul, Breaker of Worlds, has come! The mortals and immortals will know the meaning of Fear Itself! Gary,I know this is a spoiler but what is the tie to recent otherworldly developments that you mentioned regarding the Hulk? Is related to the Greek gods and Zeus or something else? Zeno, I was referring to "Planet Hulk" so I guess it's not so recent. "Nul, Breaker of Worlds" = a clever inversion of "Worldbreaker." That's all. That is what I thought you meant. But I wasn't sure. Thanks for clearing that up,Gary.